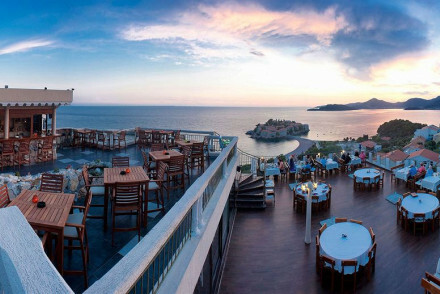 Sveti Stefan is one of the most stunning spots on the whole of the beautiful Budvar Riviera. A tiny, yet spectacular island of 15th Century terracotta-roofed buildings connected to the mainland by a spit of bleached sand. The island itself is now entirely taken over by the luxurious Aman resort which is definitely one of the best places to stay in Sveti Stefan, and the whole of the riviera. Sveti Stefan is just 5kms south of Budva and definitely worth a look around even if you’re not staying nearby. There are perfect beaches both to the north and south and a lovely path leading in and out of the cypresses along the coast. There is also a nice monastery. Perhaps not a huge amount in the way of shops or restaurants, but Budva has plenty of choice. Unwind on picture perfect beaches. Take a walk through the beautiful Milocer park, the old summer residence of the Karadjordjevic family. Embark on a picturesque hike in the mountains above Sveti Stefan and enjoy panoramic views over the island. Discover the medieval monasteries of Pastrovici, hidden amidst the woods. Don't forget that the best places to stay in Sveti Stefan will be extremely busy during the peak summer months, so do yourself a favour and book early! The Hotel Adrovic is a boutique hotel just above Sveti Stefan beach with 18 charming rooms and multi-bedroom suites all fitted in an eclectic style. The views from the terrace restaurant are wonderful, plus you’re surrounded by beach options. The Hotel Azimut has 17 rooms, suites and apartments overlooking the bay, with private balconies, lovely, neutral decor and a wonderful terrace restaurant serving excellent seafood. The Aman Sveti Stefan is about as luxurious as it comes. Beautiful private cottages with all the mod. cons., panoramic views, private pools, three beaches and three restaurants. Fly to either Tivat Airport, Podgorica Airport or Dubrovnik Airport all under 65km from the island. Best time to visit - Sveti Stefan's best weather comes between the months of June - August when temperatures average around 28°. The winters are cold and there is often heavy rain. 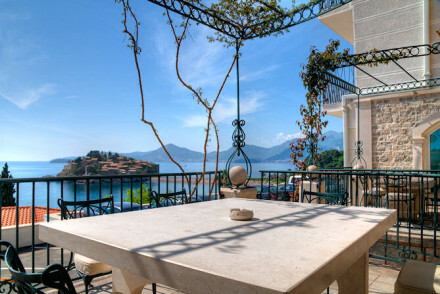 Browse through our list of all the best places to stay in Sveti Stefan. Expand your search to include all recommendations in Montenegro. An idyllic luxury village paradise on the tiny islet of Sveti Stefan. Luxurious private cottages and suites renovated in country chic style with all the mod cons, some with private pools and terraces. Three excellent restaurants, top of the range spa, and access to three beaches. Divine. Foodies - Many dining options include Mediterranean cuisine, Dalmatian and international. Honeymoons - You can order private sun set dinners from your own terrace. Chic - Sophie Loren used to stay here in the 1960s. Views - Stunning panoramic sea views.